Boyer in action, shortly before apologising to his opposite number. Position: Centre-midfield, but I like to wander. Pre-game superstitions: Best of Zidane video to the sound of “The Scientist” by Coldplay; banana, oats and protein; foam rolling; and of course, my BreatheRight nasal strips. Favourite Hatchets moment: Scoring the game winner against Naita early in the season. I was getting worried that the lethal zones were not a thing and I had been duped by adidas. Team-mate you hate having to play on in training games: Bjorn, he’s an animal and toughest guy to get man-marked by. a) Last man standing at end of a big night? Not me. Probably Drew Williams, he’s got old man drinking stamina. c) The most likely to start a pub brawl? Alex Cote, over someone questioning the quality of the German national side. 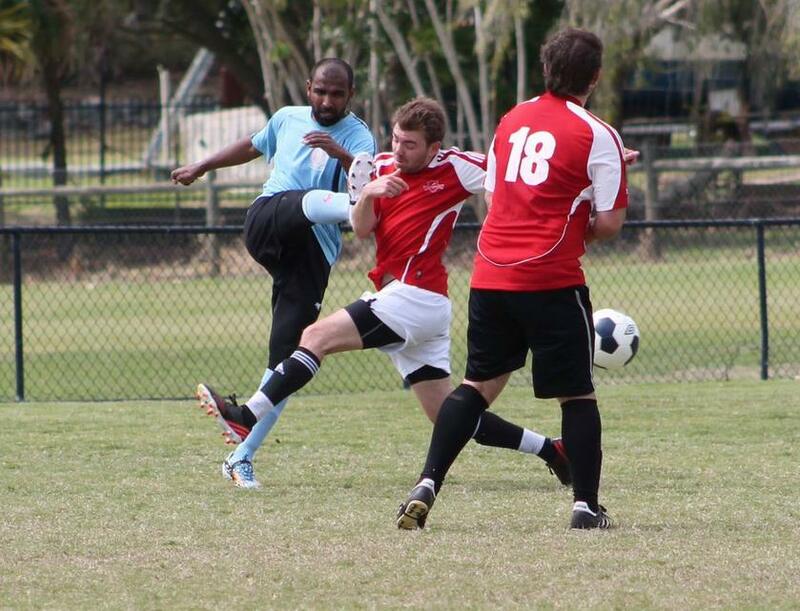 Team mate you’d hate to live with most: Steven Cecchi… nothing against the guy, just don’t want to be in Rockhampton. Which Hatchets player would you choose to take on Naita Phoenix’s #10 in a no-holds-barred street fight? Tag team of George and Bing. I’ve been waiting to see their physical side all year! Favourite Australian beer: Little Creatures Pale Ale… but I can settle for anything that’s not four X.
What’s your second-most-wanted speciality, after ob/gyn? Geriatric ob/gyn. Mario Götze is 22 and has a World Cup medal. What’s your excuse? I’m French. What’s been your worst season-ending injury so far this season? Three way tie between hip, knee and my spirit. Who will win the QMST tournament and why? UQ, because I will be too hungover to yell at people. Who’s your Hatchets player to watch for the tournament? Sonesh. He’s in great end of season shape and I’ve been waiting for him to really light it up. What’s the first bet you’ll make in Jupiter’s Casino on the Gold Coast this weekend? A $5 bet with Simon Bennet that I can beat him at a skolling contest. Many observers have noticed Hatchets players putting in improved performances when their girlfriends are present. How do you think you’ll play with your girlfriend at the games on Sunday? My performance will not be affected by having my girlfriend read a fantasy novel in a shady corner of the field. But I will try not to draw her attention to me from any “shrieky anger” outbursts. Check back in to http://www.herstonhatchets.com on Monday morning to find out how Boyer fares on the Gold Coast. Many pundits have predicted Nicholas to steal the show on the football field, and Pierre to claim the spotlight at Jupiter’s Casino the night before. This entry was posted in Player Profiles and tagged Pierre-Nicholas Boyer, Player Profiles. Bookmark the permalink.